PEC Senior Principal Kirk Marchand and Managing Principal David Stevens will be attending MABS 25 (Military Aspects of Blast and Shock), in The Hague, Netherlands. MABS is an annual international conference that gathers world class engineers, researchers, and military and industry partners to discuss recent developments in the field of explosives effects. The full conference schedule is available here. In addition to chairing a technical session on “Explosive Event Simulation,” Kirk will be presenting two papers: “Evaluation of Fragment Size Distributions for Overloaded Construction Facades: Experiments and Data Collection” and “Evaluation of Fragment Size Distributions for Overloaded Construction Facades: Data Analysis and Distribution Prediction”. In the first presentation, Kirk discusses the collateral damage threat posed by facade fragments and the need to understand the size distribution and momentum of fragments. PEC, DTRA and SRi scientists and engineers have performed ground-breaking research in this area using sophisticated experimental and statistical analyses methods. For material level fragmentation, 16 small shock tube tests were conducted. 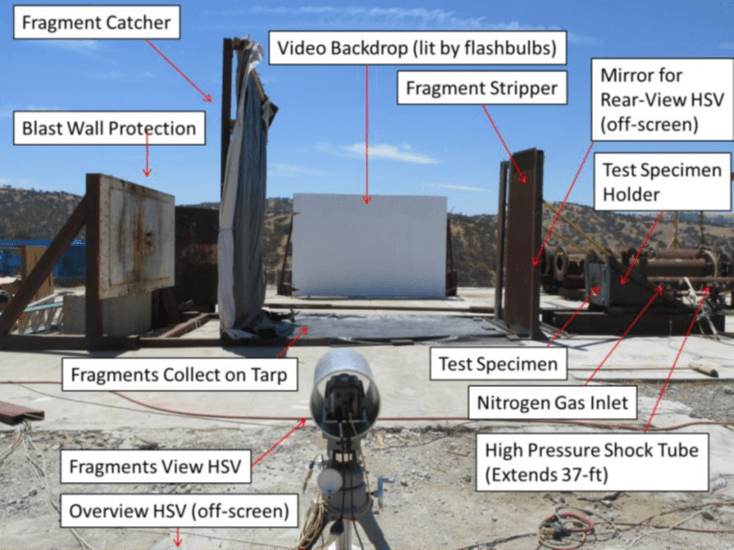 For structural-level fragmentation, 5 tests were conducted in a large diameter shock tube. In both series, the fragmentation behavior of concrete, glass, and concrete masonry was investigated. After fracture of the specimens, fragments were retained through the use of a catcher system and videographic analysis was used for in-flight velocity and mass measurement of fragments. In the first paper, an overview of the experimental techniques, a summary of results, and successes and failures in the testing and data collection are provided. This data was used in subsequent analysis and predictions of mass and velocity distributions which are discussed in the second paper. David will be presenting “Validation of Open-Source Airblast Solver (blastFOAM) in an Urban Environment”. blastFOAM is a new software tool for modeling the physics of compressible multi-fluid flow in explosive detonations. blastFOAM was developed from OpenFOAM, an unrestricted, parallel, open-source solver that provides a readily extensible and widely used library, is supported by a large and active community and provides mesh generation and pre/post-processing utilities. blastFOAM was originally validated through comparisons with experimental data from laboratory tests of enclosed detonations and simple field tests with a reflective surface. 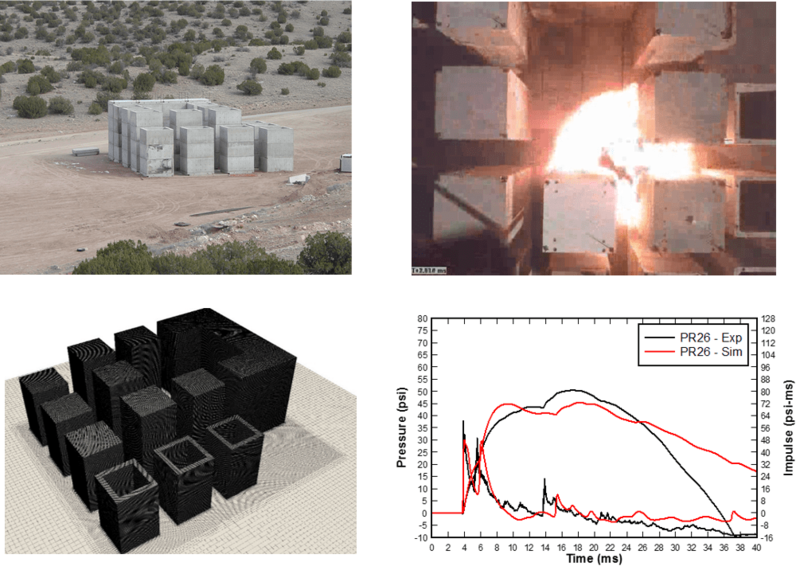 PEC has recently applied blastFOAM to model tests of blast propagation in the EMRTC urban canyon test facility. The comparisons between test and synthetic data show exceptionally strong agreement. The benefits of blastFOAM will be discussed: fast model creation and meshing, swift and scalable execution times, intuitive post-processing capabilities and exceptional accuracy. If you’re attending MABS 25, be sure to catch their presentations. For more information on PEC’s work in research, analysis and design for blast effects, please contact Kirk Marchand or David Stevens.